Laboratory work for obtaining some important parameters and graphs of dependence of magnetic permeability of ferromagnetic materials on the magnetic field. As a result of its holding, the user receives all the necessary data for the construction of real generators and experiments with inductors. In addition to University lab, the calculator computes the theoretically achievable value of increment of efficiency of the second kind for the parametric change of inductance with back EMF. Theoretical justification of the additional energy from the back EMF in the inductor core is provided here. The calculator is designed to calculate the parameters of a single-layer coil by 1/4 wavelength, taking into account the capacity of the ground. Connecting external tanks: the Torah and the condenser, makes it possible and the classical calculation of the Tesla transformer. The lower subsection of this calculator is the precise definition of the capacity of the ground for that coil in your area. The new version of the online calculator for combining different types of waves in a single layer inductor. Counts of various coil parameters depending on its design and the material of the frame. It is considered grounding and shielding. A previous version of this calculator is here. Animated representation of the standing waves produced by the excitation of a long line set of waves consisting of several harmonics. Changes the phase and the amplitude of the harmonic, the ratio of the length of the line frequency, q-factor. Counts of some output parameters of the Tesla transformer under impulse excitation. The result is displayed relative to the first harmonic from the spectrum obtained in the secondary circuit of the oscillation. Calculator calculates the output parameters: operating voltage, power dissipation and phase of the voltage depending on the input a sinusoidal voltage to RC or RL circuit. Also counted and the value of the reactance of capacitor or inductor for a given frequency. The calculator allows you to calculate the parameters of the dual-frequency diagrams of series and parallel resonant circuit. It is possible to into account the capacity of the ground and has several modes of distribution of waves in the primary coil. There are recommendations for the practical implementation of the device. 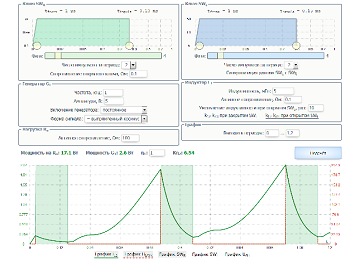 The calculator allows to find the optimal parametric dependence of change of inductance of current and mode excitation of the generator to produce maximum efficiency in a closed RL-circuit, where the source of power is back EMF. The calculator is designed to calculate the parameters of different circuit solutions to the current amplifier. His calculations are based on combined parametric circuits of the first and second kind and rather accurately reflect the phenomena occurring there. Also, the calculator can be used to study transients in parametric and non-parametric RL-circuits.